PA online sports betting is almost here. Sports betting is legal in PA as Pennsylvania lawmakers have licensed several casinos throughout the state for accepting sports bets, and will soon do the same for online sports betting. As of April, 2019, there are eight casinos, race tracks or turf clubs accepting wagers. But the real shift will come when online sportsbooks launch in the state, likely sometime in Q2. Recent comments from state officials indicate that PA online sports betting will go live in late April or early May of 2019. Here is everything you need to know about online sports betting in PA. When will online sports betting launch in PA? Does Parx casino have sports betting? When will PA sports betting be legal? Why are there so few betting apps in PA? Who is eligible to launch an online sportsbook in PA? Do I have to be in PA to bet? What types of bets can I make in PA? What are PA sports betting tax rates? When will DraftKings and FanDuel launch sportsbooks in PA? Why isn’t DraftKings in PA? Will you keep me updated? SugarHouse is particularly interesting because they already participate in online sports betting in New Jersey through their PlaySugarHouse.com app, which offers an online casino and sportsbook. SugarHouse Casino is one of the first PA casinos with sports betting. It opened its doors to sports gambling in December and since then has been a popular location for Philly folks looking to wager on the NFL, NBA, college basketball and more. We interviewed VP and General Counsel Evan Davis in February about how quickly betting as taken off. Meanwhile, the SugarHouse sports betting app is expected to be one of the first to launch in Pennsylvania. Why? Rush Street Interactive runs the popular PlaySugarHouse app and will also back a similar offering from Rivers Casino, more familiar to folks in the western half of the state. Since both are already licensed in PA and plan on operating under their own brand name, they should easily be able to impart existing technology from New Jersey to launch their online casino app in PA.
Parx online sports betting is already in the works and technically live through Parx’s betslip builder, which allows customers to place mobile bets at the physical sportsbook. Parx Casino opened its temporary sportsbook in January while they await the opening of a 10,000-square foot facility slated to open in the spring. Parx is working on their own betting app, planning to leverage their local brand in eastern PA to gain significant market foothold early on. Their app will be underpinned by the popular Kambi technology, which sets the markets and powers the sportsbooks for DraftKings, SugarHouse and 888sport. And while this creates a certain level of sameness across the different options, each is free to layer their own UI, promos and customer experience on top. Parx, I’m told, is working to heavily customize their offering and understands their sportsbook needs to resemble something closer to a tech product than a bolt-on casino as was the case with some other casino-to-app skins. If nothing else, the Betslip Builder allows PA residents to see a glimpse of current lines at Parx. Rivers Casino’s online sportsbook should look and feel very similar to SugarHouse’s. In fact, it might be identical as both are owned by Rush Street Interactive and will likely use the same backend. A free preview of Rivers Casino’s sports betting app has been made available and it looks exactly the same as SugarHouse. Which one customers use for PA online sports betting will likely come down to a brand preference between Rivers and SugarHouse. FanDuel has a partnership in place with Valley Forge Casino and Resort. The latter had its sports betting certificate conditionally approved in late December and opened its retail sportsbook in March. A FanDuel Sportsbook app in PA is in the works and should launch between April and August. DraftKings undoubtedly has plans to enter the PA sports betting market, but as of yet they don’t have a casino partner. Unlike in New Jersey, where each licensed operator can work with up to three partners for their online app, in Pennsylvania each operator can only be partnered with one. DraftKings still has options, but they haven’t yet found one, and thus their launch looks more like its destined for late 2019. BetStars will bring its sports betting app to PA. It’s unclear when the app will launch, but casino partner Mt. Airy Casino Resort has filed for a sports betting certificate, so it will likely be sometime in 2019. Unibet struck a partnership with Mohegan Sun Pocono to bring its popular sports betting app to PA.
State officials previously indicated that they would launch online sports wagering in Pennsylvania after online casinos and gave a June-July timeframe. That won’t be the case. At a board meeting on April 17, 2019, the PCGB declared that online casinos would launch on July 15. No mention of the sports betting was made, however later in the day Communications Director Doug Harbach told us that testing will begin on one sports betting app in three weeks. Previously, Marc Oppenheimer from Parx Casino said his company would be ready to launch in PA in late April. It is unclear whether Parx will be the first app to launch or not. But it now looks like online betting could be live in PA for the NBA playoffs. Yes. The state passed a bill legalizing both casino-based and online betting in Pennsylvania. Multiple casinos and turf clubs now offer sports wagering, with online sports betting expected in the coming months. Yes. Parx as a sportsbook inside its Bensalem location along with smaller lounges at the Turf Club in South Philly and Valley Forge Turf Club. Parx will bring its online betting app to PA sometime in 2019. It already is. You can bet in-person and, soon, online in Pennsylvania. Unlike other states, the Pennsylvania Gaming Control Board allows for one sports betting “skin” – essentially a public-facing brand – for each licensed casino operator, of which there are 12 in Pennsylvania. This, obviously, caps the number of apps at 12. The following are the licensed “slot machine operators” who are eligible for a sports betting certificate in PA: Hollywood Casino at Penn National Race Course, Harrah’s Philadelphia, Parx Casino and Racing, SugarHouse Casino, Lady Luck Casino Nemacolin, Sands Casino Resort Bethlehem, Valley Forge Casino Resort, The Meadows Racetrack and Casino, Mohegan Sun at Pocono Downs, Mount Airy Casino Resort, Presque Isle, and Rivers Casino. Multiple casinos and turf clubs now offer sports betting in Pennsylvania (see listings in this post). Soon mobile betting will launch. If you are betting online, yes, you will have to be physically located in the state to bet on sports with PA sports betting apps. However, you may be allowed to bet on sports in other states where online sports betting is legal. Spread bets, moneyline bets, over-under bets, parlay bets, prop bets and more are all available at PA sportsbooks. Sports wagering is taxed at a 36% tax rate in PA and operators have to pay $10 million upfront for their sports wagering certificate. DraftKings will need to find a casino partner to launch its sportsbook app in PA. They struck a deal with Caesars to gain market access to a number of states, but it curiously didn’t include Pennsylvania, and it sounds like Caesars will use its Harrah’s brand in PA. DraftKings will have to partner with one of the remaining casinos if it wants to be involved in PA online sports betting. Hollywood Casino at Penn National Race Course 777 Hollywood Blvd. SugarHouse Casino 1001 N Delaware Ave.
Parx Casino 2999 Street Rd. Rivers Casino 777 Casino Dr.
Parx at The Turf Club 700 Packer Ave.
Valley Forge Casino 1160 1st Ave.
Valley Forge Turf Club 600 Cresson Blvd. In November, Penn National Gaming launched the first legal sportsbook in Pennsylvania. The physical location is managed by William Hill, which is the largest sportsbook operator in the US, running several joints in Vegas and New Jersey. Rivers Casino opened their space for testing on the same day as SugarHouse as they both have the parent company Rush Street Interactive. Parx recently opened its temporary facility, which I actually toured before opening, and while it’s not large, it’s fairly impressive, but will pale it comparison to the 10,000 square foot behemoth they plan to open in the spring. I can tell you there is a lot of construction going on at Parx, and they seem poised to capitalize on PA sports betting– their location and brand recognition in the Philly area will help that get out of the gate early. An extension of the Parx sportsbook branding, a second location has been opened at the Turf Club, located inside the Holiday Inn across from Citizens Bank Park. Harrah’s began taking sports bets on January 22 at 2:00 p.m. with a grand opening on January 24, where Brian Westbrook cut the ceremonial ribbon. January 22 starts a two-day operational test period and approval from the Pennsylvania Gaming Control Board (PGCB). The PGCB will hold testing on January 22 and 23 from 2:00 pm to midnight. Harrah’s Philadelphia’s sportsbook will offer betting on a variety of sporting events like football, basketball, baseball, hockey, soccer, and college athletics. Betting options include straight bets, parlay bets, total bets, in-game betting, and more. Also, Total Rewards members will be able to earn valuable points for every wager made in The Book. The sportsbook will be open Monday – Friday 11am -12am and Saturday – Sunday 10am – 12am. Guests must be 21 years of age or older to enter the casino floor as well as to place bets. Located in the back of the casino floor previously reserved for “The Block,” The Book at Harrah’s Philadelphia is equipped with 19 better-than-stadium lounge seats, 11 high-top tables, various bar seating and over 45 large screen TVs to watch the action live. Food and beverages tailored specifically for game day will also be available. Valley Forge Turf Club opened on March 14, just in time for the NCAA Tournament. It is owned by Greenwood Gaming, owners of Parx, which now has three sports betting locations in Pennsylvania. You bet! 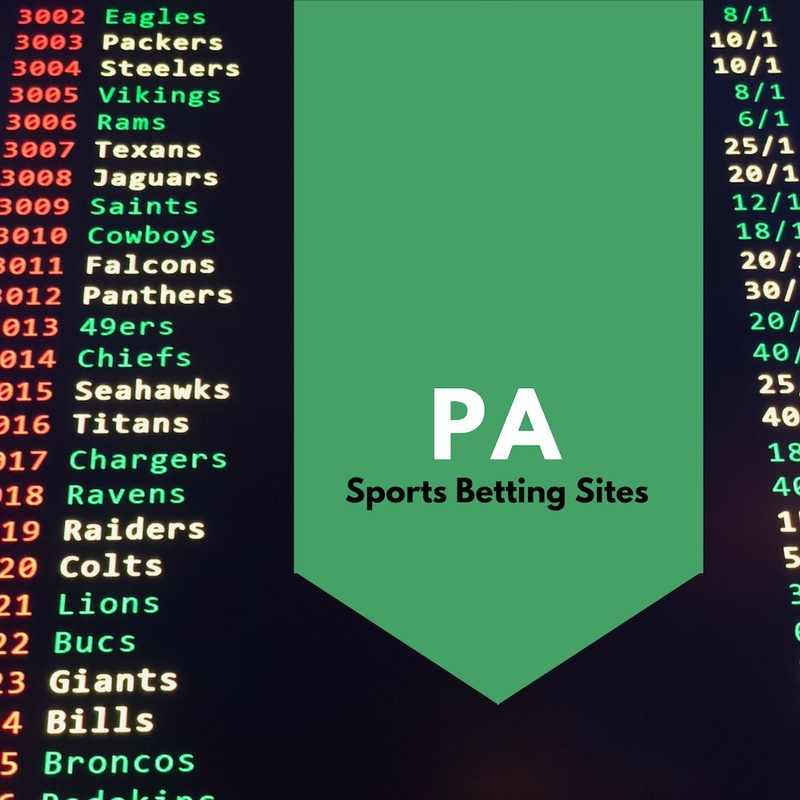 I have continually been asked about where and how you’ll be able to bet on sports in PA from readers who have seen our coverage. We intend to partner with as many sportsbooks as possible to offer you exclusive signup bonuses, unique odds and other promos for sports betting in PA. We’ll keep writing about it here on the site, but the best way to stay updated is to sign up for our email list (we won’t spam you). We have big plans for a more betting-related content (think, studio) and job postings for those positions so you’ll want to follow us. There were two themes at the East Coast Gaming Congress, and the biggest one was the importance of online betting. Something like 70% of the market in Europe is mobile or real-time betting, also called live betting. Many of these are prop bets. This is the growth area, no doubt about it. Consider this stat: There is $150 billion wagered on sports in the US each year. Only $3 billion of that is in Nevada. The other $147 billion is either through illegal bookies or non-regulated offshore sites. The gaming industry wants a piece of that market. They will compel states to adopt favorable regulations in order to offer competitive mobile betting products. This centers around real-time or “in-play” betting. The most obvious example is a second half betting line that may be available during a basketball or football game. But the ubiquity of mobile devices creates many more possibilities. You can bet on the next series, drive or play. It’s the second screen experience for sports– everything from “who hits the next three-pointer” to new moneyline odds being offered throughout the game. This type of betting is arguably more fun (and addictive) and is the growth area for the industry. The industry is well aware that anyone can go online and place a bet today. How do they beat the offshore sites? The main message was that aggressive tax rates would pass along costs to the customer, presumably in the form of poorer odds. They showed studies indicating that a 10%-15% tax rate is the range which guarantees the greatest output for the state before significant customer losses. Again, Pennsylvania is currently at 36, which means PA sports betting sites will have to deal with significant more costs, limiting the amount operators may want to focus their efforts. We have spoken to several books that have no plans to even enter the PA market. This is doubly a problem when you consider that PA casinos will have to brand their apps with their own names, thus not allowing for DraftKings or FanDuel to have their own apps in the state (they’ll have to settle for “powered by” or something similar). This gives SugarHouse, and maybe BetStars, an opportunity to gain market share since they won’t be competing as hard with the big brands. Further, the offshore market excels in online betting. Some states, like Mississippi, will legalize sports betting but not allow it online. That is a mistake. It misses the entire point of this movement (for states), which is to maximize tax revenue. Not allowing online sports betting leaves a lot of money on the table… or perhaps just sends it to Costa Rica, where many of the offshore sites are located. One way the regulated space could have an edge over offshore sites is in partnering with the leagues, both in terms of branding (expect sponsorships) and data. Think about real-time betting, perhaps a wager on pitch speed (will someone throw 100 mph this game?). Who verifies the data? Unlike scores and basic stats, which can be easily checked against an official box score, data required for prop bets may need a trusted partner. This can both provide a competitive advantage over the black market and create revenue opportunities for the leagues, which can license the data to sportsbooks. To be clear, the gaming industry wants to partner with the leagues– they just don’t want states to mandate a 1% integrity free, something which thus far has been met with resistance from the states anyway. The league will profit regardless through increased interest and viewership, but it seems the way to get money directly from the operators is through direct business relationships. The Sixers – along with the Devils – just announced a partnership with Caesars, while the major professional basketball and hockey leagues have announced licensing, content and data deals with MGM. Thankfully, the legalization of online gaming for poker and such in New Jersey and Delaware has paved the way for sports in Pennsylvania. Credit card processing was an early hurdle in those verticals because banks were worried about fraud. Once the gaming industry proved that it could effectively police itself, Visa, MasterCard and others became more amenable to handling the transactions. The gaming industry knows it needs to make depositing (and withdrawing!) money a painless experience if PA sports betting is to gain traction. This creates a literal instant advantage over the corner bookie, and having a regulated operator take your action is a safer experience than playing with offshore sites. Anna Sainsbury, the CEO of GeoComply USA, a company that provides geo-fencing services for iGaming products, talked about ways to effectively ensure players are in-state. That part is relatively simple. But consider the PA commuter who works in New Jersey or Delaware. What if they can’t place a bet from work? With these states being linked, there was some discussion about allowing wagering across states lines. That’s an area that has yet to be fully worked out, though the industry is aware that creating a consumer-friendly solution is important. Geoff Freeman, the outgoing CEO of the American Gaming Association, said there was essentially no chance of federal regulation for sports betting. It sounds like it will remain a state issue. This goes without saying, but as more states come online, gambling sponsorships will begin to pervade sports. Almost every major soccer team in the Premier League has a gambling partner. Expect much the same in Pennsylvania. This section was put together by Mike Lyon. He is an attorney in Montgomery County, PA specializing in litigation and gaming law. He tracks all developments in sports gambling in the United States, with a particular interest in Pennsylvania, New Jersey, and Delaware. The information provided in this post is not intended to be and should not be construed as legal advice. You should not act or rely upon information contained in this post without specifically seeking professional legal advice. When the Supreme Court struck down the Professional and Amateur Sports Protection Act (PASPA) in Murphy v. NCAA, et al. in May of this year, a day that many sports fans had dreamed of became reality. With PASPA nullified, legalized sports betting had finally become a possibility outside of Nevada. All the attention being paid to the legalization of sports gambling in New Jersey and Delaware has left many fans in Pennsylvania wondering when it will come to the Keystone State. As of press time, while PA sports betting is, technically, legal, regulated sports betting has not yet begun. While the exact date that betting will begin in Pennsylvania is still very much unknown, potential bettors should rest assured that it should begin very soon. In October of last year, Governor Wolf signed into law a massive expansion of gambling in Pennsylvania. That legislation allowed sports gambling to be legalized if the existing federal ban in PASPA was first repealed, which thereafter occurred when the Supreme Court nullified PASPA in Murphy. The gaming law restricted the possibility of hosting sports gambling to Pennsylvania’s 12 casinos, any of whom could apply for a “sports wagering certificate” with Pennsylvania’s Gaming Control Board (GCB). Holders of a sports wagering certificate would be permitted to take in-person wagers in a designated sportsbook or area within the casino. Online betting was also legitimized by the statute, and certificate holders would be permitted to take wagers through a mobile app or Internet site. The law provided a 120-day window for the GCB to accept applications for sports wagering certificates, which it began to do on May 31, 2018. Given how popular legalized betting was thought to become, and the national attention paid to Murphy, it was thought that applications would come quickly. Many surmised that sports wagering would be operational in Pennsylvania long before the start of the NFL season in early September. But the fees to be paid by potential applicants for sports betting certificates likely caused (and may still be causing) significant hesitation. The gaming expansion statute required any sports wagering certificate applicant to pay a $10 million initial fee to the GCB following approval of the application. It further requires a renewal fee of $250,000 to be paid to the GCB every five years thereafter. Those entry fees dwarf the comparable fees in New Jersey, which required casinos to pay just $1.2 million in licensing fees (which also include the fee required to carry an internet gaming platform, which is not yet operational in Pennsylvania and not a part of the $10 million initial fee). In addition, the taxes payable on PA sports betting proceeds are substantial. The gaming expansion law provided a whopping 34% tax rate on gross sports gaming revenue to be paid to the state, plus an additional 2% to be remitted to local or municipal taxing authorities. That makes for an effective 36% tax rate on all betting proceeds. This dwarfs the 8.5% rate for in-person bets or 13% rate for online bets over the bridge. The taxes and fees make for a good reason to be cautious about beginning sports betting operations in Pennsylvania. Legalized betting in Pennsylvania is inching closer. Whenever the first bet is placed, Pennsylvania certainly appears to be ready to reap substantial financial benefits from what should be a very popular endeavor for fans across the Commonwealth.